Nick Bassett isn't the fastest or the strongest guy in town, so he might not make a big impression if you see him running on the Coastal Trail or weight-training at the YMCA. But he's a star in the ultrarunning world. 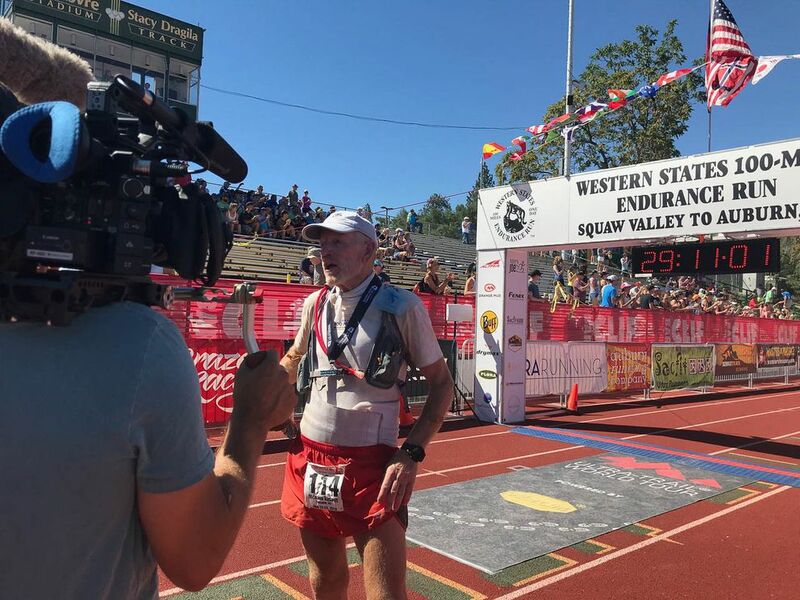 Last month Bassett, 73, left his mark at the Western States 100 in California, where he became the oldest finisher in the nation's oldest 100-mile footrace. Bassett beat the 30-hour cutoff time by 51 minutes to set a new standard for old runners in the punishing race from Squaw Valley to Auburn. The previous oldest finisher was 71, and since the inaugural race in 1977, only three people over 70 have finished it. The achievement landed Bassett in Runner's World magazine, much to his astonishment. "I'm just a guy who goes out and enjoys running a few miles," he said. A retired salesman and an experienced ultrarunner, Bassett divides his time between Anchorage and Cheyenne, Wyoming. He has a home and an adult daughter in Cheyenne, and a home-away-from-home and a significant other in Anchorage. The significant other is Barb Elias, an orthopedic physician assistant at the Alaska Native Medical Center who was part of Bassett's support crew at last month's race. The support crew also included Alysa Horn, a basketball-player-turned-trainer who introduced Bassett to weight training a little less than a year ago. Horn starred at Kodiak High and UAA before playing two years of professional basketball overseas, so she has seen her share of outstanding athletes. But Bassett and his fellow ultrarunners impressed her in a way little else has. "A basketball player is used to running up a 94-foot court for 40 minutes," Horn said. "I could not believe that these people are capable of running 100 miles all in one go. I don't think I have run 100 miles total in my whole life. "There are no words to describe seeing (Bassett) do it. It was inspiring. And this is the cool thing about Nick – he did not sit down, not once." The Western States 100 tortures runners with 18,000 feet of uphill running, nearly 23,000 feet of downhill running, a river crossing and other demands. There are 21 aid stations along the way, at which many runners pause to give their legs a break. 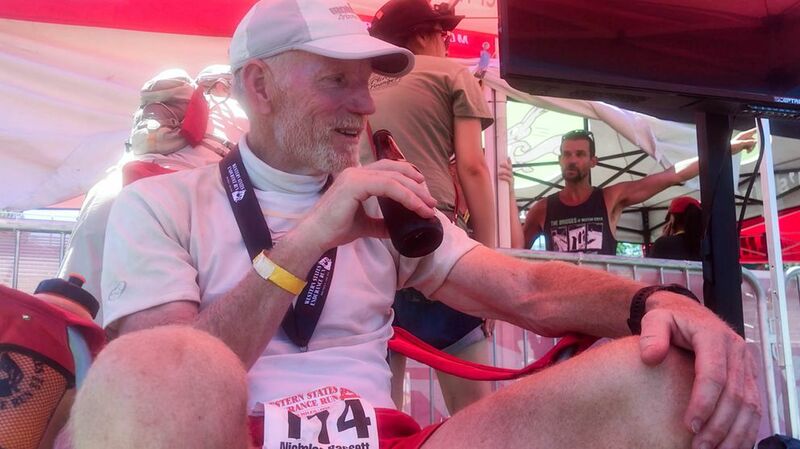 He's the veteran of 53 100-mile races, including 14 Western States races, and he seldom sits down during the 25 or 30 hours it takes him to finish an ultramarathon. "I've had bad days where I've said, 'I gotta take 15 minutes,' '' Bassett said. "But I'm sorta of the belief if you're not moving forward, you're wasting time." Bassett began running at age 36. Within a year or so he had completed his first 26.2-mile marathon, and within three years he had completed his first Western States 100. His most recent finish gives him at least one finish in five decades. He has completed the Western States 100 in his 30s, 40s, 50s, 60s and 70s — and he isn't ruling out doing it in his 80s. "If I live that long," he said with a laugh. "I still enjoy it, and I'm fortunate I haven't had any major injuries," he added. "I've never been one of those frontrunner guys. I didn't start running till I was 36, just to lose a few pounds, and I never thought about being a runner because those guys were all skinny and wore those little shorts." Bassett believes that slow and steady wins the race, or at least completes it. His evolution as a runner started slowly. He followed a program that starts with running one mile a day, increasing to 1.5 miles after a week or two, then two miles, and so on. Less than a year later, he was ready to take on his first marathon. "People said 'You're crazy; you can't run a marathon the first year you start running,' but I said I'm gonna do it, and so I did it," Bassett said. "And it worked perfect for me. I wasn't trying to set any world records." Bassett is blessed with a motor that would give the Energizer Bunny a run for the money. 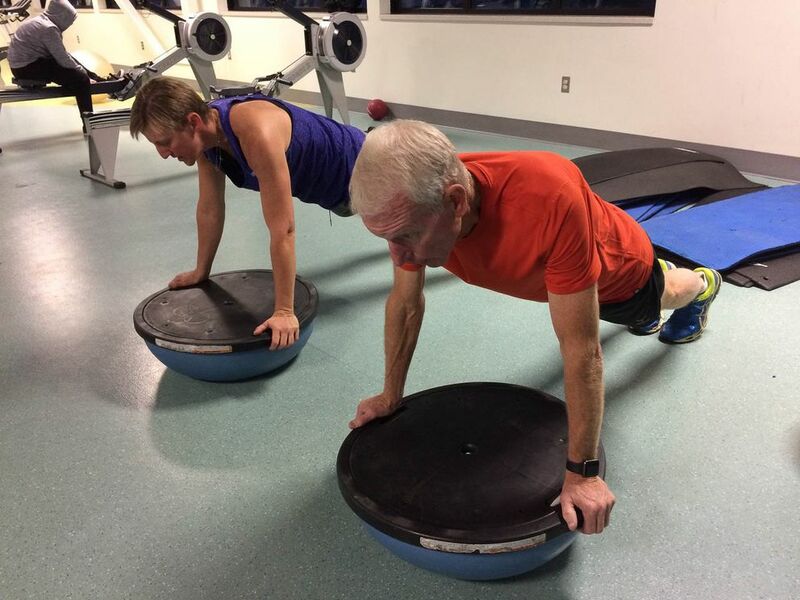 About 18 months ago, a doctor put him on a treadmill with the goal of getting his heart rate up to 125. When it got no higher than 120 despite a steep incline and plenty of time, the doctor gave up and told Bassett to get off the machine. "My heart rate even when I was younger didn't get up to more than 150," Bassett said. "My pulse is still reasonably low." When he was younger, Bassett said, "I could run 7-minute miles all day long." These days, he said, he can run two or three miles at a 10-minute pace. But if he combines running with walking, he can go for miles and miles and miles. "My philosophy is if I can't run an 8-and-a-half, 9-minute mile, I'll walk for 30 seconds and then I'll run hard for 45 seconds and catch up aerobically," Bassett said. "It's amazing how much more efficient you can get. You can run a little bit faster, walk a little bit faster, and you don't get completely anaerobic, you stay aerobic that whole time." During the race, Bassett maintained his run-walk rhythm from 6 a.m. Saturday until a little after 10 a.m. Sunday. The race punishes runners from the get-go. In the first 4.5 miles, racers go from Squaw Valley to the top of Emigrant Pass, a climb of 2,550 feet. 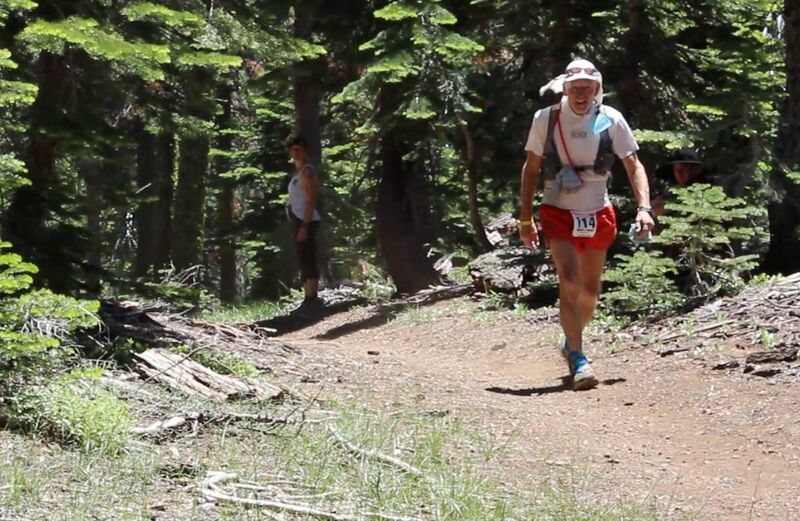 At a checkpoint 30 miles into the Western States race, Horn got a chance to see how Bassett was doing. He arrived about 75 minutes behind his expected schedule, she said, "and I was worried for a minute." "When I saw him he looked great," she said. "It turned out he was just being conservative. That's smart." Bassett said he deliberately chose a conservative pace because he was determined to join the elite over-70 finishers club. He made the 30-hour cutoff despite taking a wrong turn that added about 20 or 30 minutes to his journey, and despite stopping at the bottom of a hill for 10 or 15 minutes to chat with an old friend. The next time, he said, he'll be more concerned about speed — if there is a next time. The race is so popular, runners must win a lottery to gain entry. Bassett said there were 4,974 names vying for 261 spots this year, and his was the first name drawn. He joked that he should've bought a Powerball ticket that day. "When they drew my name I said to myself, 'Great, I'm going to be one of the next 70-year-olds,' " he said. "I was never concerned about not finishing. I never had it in mind to go as fast as I could go and set some crazy record." "I said yeah, if you're offering me a spot," he said. "If there's any chance I get in next year, I'll be in better shape."